Major: I’m an international relations major, pursuing a certificate in Portuguese. In addition, I’m currently a fellow for the National Security Studies Intelligence Community at FIU. How did you get your internship: I attended many career events at FIU and talked with the diplomat-in-residence, who helped me polish my statement of interest. I also did a lot of research online for government internships and talked with my professors about opportunities in my major. What projects have you worked on: I’ve been working on congressional reports on international organizations and transparency assessments for organizations like UN Women, UNICEF and UNEP. I’ve also been attending meetings for organizations at the Department of State, taking notes for my boss. How does your internship connect to your current coursework? For my internship, I am working primarily with international organizations, so many international relations classes that I took at FIU have helped in getting a sense of what IOs do and the role the United States has in each organization. I’m learning more of the financial and ethical policies within these IOs. My office also works at incorporating more Americans in jobs at IOs. What was the coolest thing that has happened thus far in your internship? There are so many cool things that I have experienced – from getting lost in the State Department building (which is actually awesome) to attending lectures from diplomats who’ve negotiated huge multilateral agreements to going to IO Executive Committee hearings, where you have an ear piece that translates everything, and you sit with delegates from all over the world. But one of the coolest experiences I have had was going to a specific IO meeting with all of the delegates from Brazil, Argentina, Canada and many other countries. My boss was trying to negotiate an added amendment and, during the coffee break, she was trying to rally other countries to agree with her points in the amendment. We were running, talking with different delegate and trying to get them on our side. I don’t think any of my classes at FIU prepared me for that! What do you enjoy most about your experience? Some of my favorite parts about interning in the State Department are all of the people I get to meet – from the other interns to my coworkers to people in D.C. It is also refreshing to be in a new place, learning about how the government works from the inside. What have you learned about yourself? I’ve learned that I can function on little sleep and lots of coffee. How has the position increased your professional confidence? I used to be nervous about going up to someone that I professionally admired and asking them questions. Now it’s no biggie! People love talking about themselves (especially important people in D.C.). So I really try to make an effort to ask questions they wouldn’t expect or ask if they have advice for a young person trying to make it in the city. I’ve received some brutally honest, blunt responses that have definitely helped in trying to navigate my future career path. How have you expanded your professional network? I’ve made a huge effort to speak to everyone in my office and throughout the State Department and learn more about their professional backgrounds. As I did this, it gave me a better sense of career paths or areas of study that I could see myself in. Since I have done this, I have created many professional relationships within and outside of the State Department. It’s also been fruitful to attend as many meeting or networking opportunities as I can because you never know who may there. What advice do you have for those beginning the internship process? The best advice I can give is to really listen to what others are saying and not go into your position thinking that you know everything. As an intern, you are there to learn. Don’t be afraid to ask questions. For example, ask your boss and the people you work with in the office about their professional history. Everyone’s experience is different. Informational coffee sessions are also a great way to learn about a coworkers experience and advice on career opportunities in the future. Don’t be afraid to send someone an email, and ask them to get coffee! 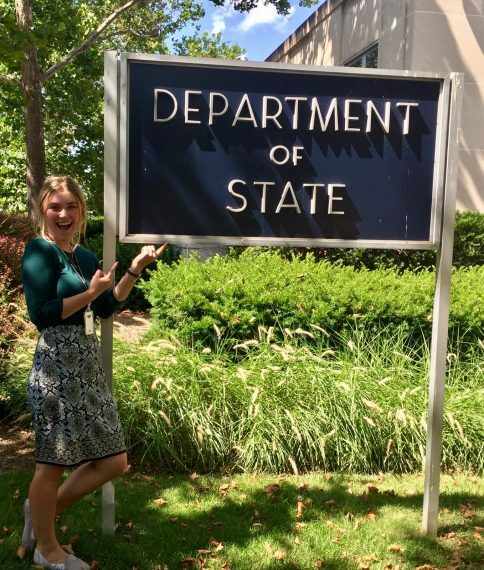 Congratulations to Jocelyn on completing her internship with the State Department. As a fellow former intern, alumni, and now employee of the State Department, I can attest to the great experience I gained during my internship. It is always great to see former panthers in DC!